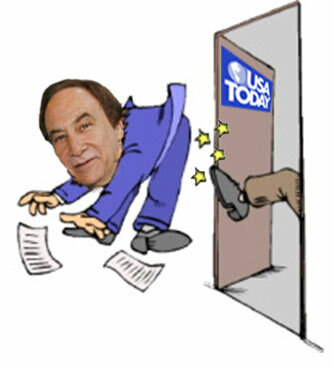 August 29, 2011 — In an increasingly digital world; a world where print media opportunities shrink by the day; a world where once thriving dailies furlough thousands of employees in a desperate effort to stay afloat; a world where true journalistic effort flags in the face of the instant feedback of the blog, USA Today manages to thrive. The newspaper, founded in 1982, is one of just a handful of national daily print newspapers and the only one besides the Wall Street Journal with any staying power. USA Today has maintained its presence in the market by presenting news in easily digestible tidbits, by presenting it in an eye catching manner and by mostly avoiding the credibility scandals that have plagued other major news organizations. There have been a few, such as the 2004 incident in which Jack Kelley, a Pulitzer Prize nominee, was accused of fabricating stories. Kelley resigned and USA Today published a front page apology in the aftermath. Obviously the paper prides itself on integrity and accuracy. Because the credibility of USA Today is clearly paramount to its survival, it is time the nation’s largest daily newspaper severed ties with oddsmaker Danny Sheridan. Sheridan posts his betting odds daily on the USA Today website although they are no longer carried in the print edition of the paper. Recently Sheridan made national headlines with claims on the Paul Finebaum radio show that he had been told by sources inside the NCAA of “bagmen” and “alleged witnesses” in an unconfirmed NCAA investigation of the recruitment of Heisman Trophy winner Cam Newton by the Auburn Tigers. As Sheridan, egged on by Finebaum, continued to make the same vague and non-specific claims he was eventually contacted by the NCAA. On Friday, Sheridan appeared on ESPN’s Outside the Lines where he repeated the same claims, offered no details or specifics other than a juvenile offer to take a polygraph test and told host Bob Ley he had declined an NCAA request to name the person or persons he had been told provided money on Auburn’s behalf to the Newtons. Sheridan’s original claim was that the information he received had come from the NCAA. It defies logic that he would be asked to provide information that he had been provided. Danny Sheridan continues to make vague, unsubstantiated claims without backing them up with proof. Contrary to his claims of having an inside source with details on the Auburn investigation, the NCAA has not provided information to Sheridan or anyone else. As a matter of due diligence, the NCAA spoke with Sheridan this week to determine if he had any facts pertaining to the investigation. Sheridan, however, did not provide any information to the enforcement staff and certainly did not provide a name. Instead, he unsuccessfully attempted to gather information for his own use. As Sheridan continues to make wild accusations and offer speculation backed up only with “you can trust me” and “I’ll drink truth serum” guarantees, the credibility of a newspaper that provides him a forum, even a minor one, is besmirched. On Outside the Lines Sheridan bragged of knowing about the impending investigations and penalties for Ohio State, Tennessee, Miami and USC. Of course that knowledge can’t be proved because Sheridan admittedly “didn’t tell anybody.” Any fool can pretend to know what was going to happen after the fact. The fact that Sheridan listed Miami as a prime SEC expansion target in a tweet days before the story of an investigation into the Hurricane program broke belies his claims of knowledge. One night at a dog track, moments after the No. 3 dog had crossed the finish line a winner, Sheridan leaped from his seat, shouting, “See! I told you No. 3 is going to win all night long!” It was the first we heard of it, and no other No. 3 won the rest of the night. He knew nothing then. He knows nothing now. Regardless of whether Sheridan knows anything or doesn’t, his repetitive claim that he has a secret source inside the NCAA creates a significant ethical dilemma for USA Today. If Sheridan does have a source in the NCAA who is feeding him information, and he is setting betting lines without divulging that information or if he is using that information to his advantage that is at the very least disturbing. If the NCAA does have a source providing confidential information to an oddsmaker, that scandal would dwarf anything to come out of the Miami investigation. It could potentially be the biggest scandal in the history of college sports. Providing an outlet for oddsmaker who claims to be privy to this type confidential information is the type of ethical grey area USA Today cannot afford to skate. It seems clear the paper itself gives no credence to Sheridan’s stories as it hasn’t even bothered to have a member of its staff speak to the Mobile oddsmaker about his claims. In the past weeks Sheridan has embarrassed himself and he has, by association, disgraced USA Today. Can a newspaper that stakes its survival on credibility and integrity afford to be associated with someone who appears as off the rails as Danny Sheridan? If USA Today executives were watching his grotesque performance on Outside the Lines on Friday, the answer to that question is clear. It’s time for the paper to move on for its own sake. Yes they need to boot Danny Boy! Sheridan ran with a rumour about Auburn, built a story around it and reported it as fact. And now he’s trapped in his own web. He should ask Scott Moore how that works out in the end. Sheridan is hanging himself with Finebaum supplying the rope. Finebaum would have sold him mother to have the blockbuster story at Media Days and he got it with Sheridan. The entire story is contained within walls of Finebaum’s studio. Sheridan is hanging himself with Finebaum supplying the rope. Finebaum would have sold his mother to have the blockbuster story at Media Days and he got it with Sheridan. The entire story is contained within walls of Finebaum’s studio. Danny “Moe” Sheridan, Scott “Larry” Moore, and Harvey “Curly” Updyke are just Three Moore Bammers… Roll “nyuk nyuk nyuk” Tide! Thanks for the link to the SI article. The guy’s been a charlatan for 40 years and mostly gotten away with it. This guy has been apart of a growing bama conspiracy to derail the AU train that has been running at full speed since 2009. If USA Today was smart the paper would fire him immediately. I have already written them to voice my own concern. And I didn’t forget JOX and Finebaum either. Please take a look at the latest Finebaum article on Sports Illustrated… the lie continues.